Former Democratic President Bill Clinton jokes with former Republican President George H.W. 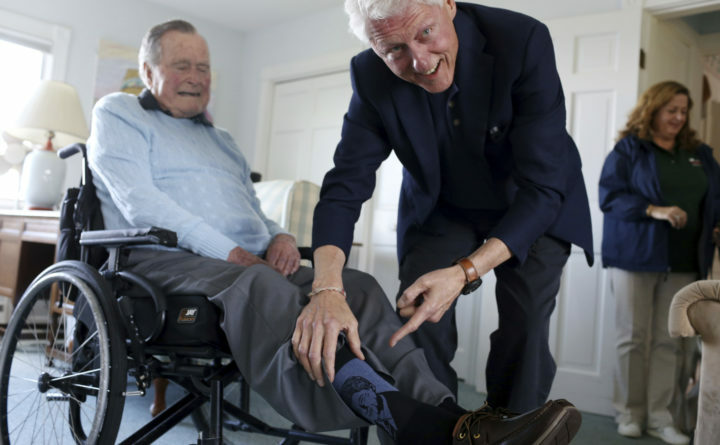 Bush as Bush shows off a pair of "Bill Clinton socks," while Clinton visits Bush at his home in Kennebunkport, Maine, Monday, June 25, 2018. KENNEBUNKPORT, Maine — Former President George H.W. Bush is welcoming a new member of the family: a yellow Labrador retriever who’ll be his first service dog. The 94-year-old and his new companion named “Sully” got acquainted Monday at the Bush family compound on the coast of Maine. The two hit it off. A photo sent via Twitter shows Sully lounging at the feet of Bush and former President Bill Clinton, who had been visiting on Monday. Sully can open doors, pick up items and summon help but “more than anything else the dog will be a wonderful companion,” said an aide, Evan Sisley. The nation’s 41st president uses a wheelchair and an electric scooter for mobility since developing a form of Parkinson’s disease. Bush is recovering from a recent hospitalization and is without his wife of 73 years, Barbara Bush, who died in April. Sully was trained by America’s VetDogs , a nonprofit that provides service dogs. “He’s a really sweet dog,” said Sisley, who hopes that Bush’s use of a service dog will call attention to the organization and to service dogs. Sully has his own Instagram account that’ll help in the effort to raise awareness, Sisley said. Bush is a dog lover who has had dogs since he was a boy, and dogs are always welcome at the family home. Two of his kids, Neil Bush and Dorothy Bush Koch, together have five dogs there, and other family members bring pets with them when they visit, Sisley said.